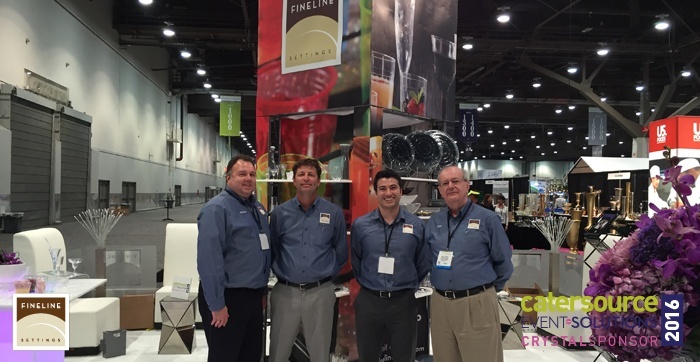 Catersource has come to an end, but Fineline is just getting started! That’s a wrap for Catersource 2016, and what a wild and inspiring ride it was! Now that we’re all home from the dazzling Las Vegas Strip, Fineline just wanted to take this time to express our unbelievable appreciation for your support! We couldn’t have imagined the amazing feedback we received, and it was wonderful to get to socialize and celebrate with YOU in Vegas amidst industry leaders and innovators! 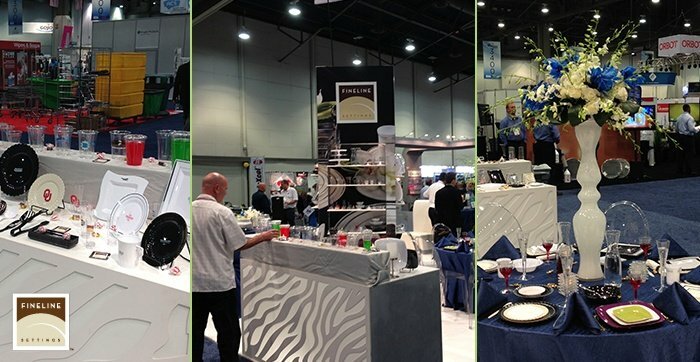 Fineline was honored to be able to be a part of all of the creative and trend-setting catering revolutions that this year’s show had to offer. 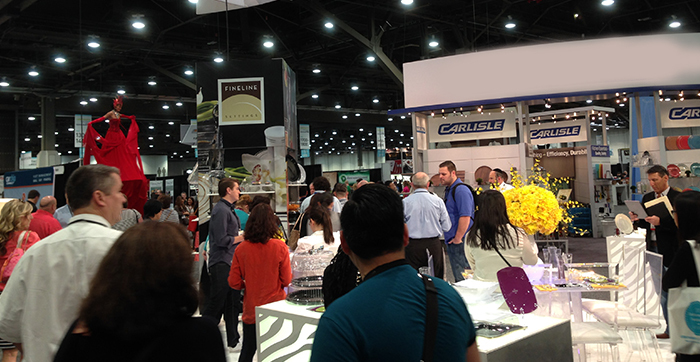 All of the Chefs, Party Planners, and Event Professionals who attended helped make this year’s Catersource the BEST YET! The influx of amazing information shared between industry leaders and small-businesses alike was inspiring, exciting, and educational; and we were thrilled to be a part of it. It was amazing for our Sales Team to get to show off our selection of new items to you. Whether it be the elegant glamor of the Heritage Colletion, or the allure of our rolled Gold Cutlery and Utensils, we loved seeing the joy you experienced at our Booth! We hope you enjoyed experiencing our new Fineline products and collections first-hand, and we know you’ll soar through the rest of your 2016 events with our disposables in your arsenal of catering favorites! Fineline can’t wait to see you next year, because we’re already getting ready! Have a great rest of your March, everyone! Come See Us For The Annual Catersource 2016 Tradeshow! IT’S ONE OF OUR FAVORITE TIMES OF YEAR- AND THAT MEANS THAT WE’RE TALKING ABOUT CATERSOURCE! That’s right, on March 13TH through March 16th, our FINELINE team will be ready and waiting to hang out with all of you at our booth #1006, and show off some of our 2016 favorites to help you plan out your next event tablescape! Hosted at the Las Vegas Convention Center in Las Vegas, this year’s event is sure to be one full of magic and excitement! With numerous seminars, shows, contests- and more, Fineline will be learning right alongside of you! When you stop by our booth (#1006), you’ll be able to get up-close-and-personal with some of our newest products on the tradeshow floor! Below is just some of what we’ll have for you to see this year! SOLID SQUARES: Our newest collection of 7 NEW Plates and Bowls, all available in 3 stylish colors to compliment you 2016 events! GOLD CUTLERY (RETAIL): Our esteemed and exclusive golden cutlery is now in retail sizes! That’s right, no matter how big or small, our flawlessly gold-finished forks, knives, and spoons will elevate your tablescape! GOLD CUTLERY UTENSILS: If you’ve wanted get a little gold with your serving utensils, wait no more! Get ready for our Golden Secrets Serving Utensil line! With three utensil options, your courses are covered… and gilded! STEMLESS: The newest standard in sipping style, our durable and crystal clear stemless goblets and flutes are sure to be a highlight at this year’s event! You’ll be amazed at the smooth quality of the tapered rim, to ensure your wines and champagnes are savored seamlessly! We hope you enjoy your time at Catersource as much as we will! Getting the chance to talk about our products with you, and listen to your feedback, is the highlight of our year! To us, we can’t think of any better way to start of 2016 than to spend it with you! FINELINE SETTINGS can’t wait to see you there, and we wish you safe and enjoyable travels from wherever you are arriving from, and that this year’s Catersource will be as unforgettable for you, as it will be for us! Can’t wait to see you in Vegas!